Day 06: Activities at chitwan national park. Day01: Arrival and Transfer to Hotel in Kathmandu. Upon arrival in Kathmandu, you are met at the airport and transferred to your hotel. Our airport representative will be holding a play card with your name at arrival hall. The drive from the airport to the hotel is around 20 minutes. It is the historic seat of royalty. The Durbar Square, with its old temples and palaces, epitomizes the religious and cultural life of people. It is here that kings of Nepal are crowned and their coronations solemnized. Interesting things to see here are, Taleju temple built by king Mahendra Malla in 1954 AD, the temple of Kal Bhairab , the god of destruction, Nautale durbar, the statue of King Pratap Malla, the big drum and the Jaganath temple. It was listed in the UNESCO world heritage monument list in 1979. On the right hand corner, a large wooden lattice screen hides an enormous gilded face of Sweta Bhairab. The screen is removed only during the Indra Jatra festival.. there are also the Numismatic museum and Tribhuban museum inside the Hanuman Dhoka palace building . Photography is prohibited inside the museums. Both the mseums remain closed on Tuesday and government holidays. This is one of the world‘s most glorious Buddhist Chaityas. It is said to be 2,000 years old. Painted on the four sides of the spire’s base are the all seeing eyes of Lord Budhha. It is 3Km west of Kathmandu city and it situated on a hillock about 77 m commands an excellent view of the Valley. This stupa is the oldest of its kind in Nepal. It was listed in the UNSCO world Heritage Monument List in 1979. 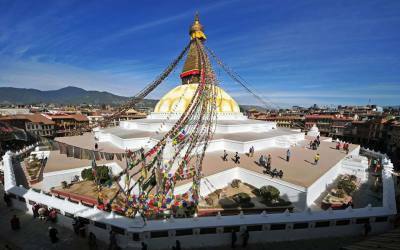 The stupa of Baudhanath lies 8 km east of Kathmandu. This ancient colossal Stupa is one of the beggest in the world. It was listed in the UNESCO world Heritage Monument List in 1979. Built in 1637 AD, the temple of Lord Krishaa holds a commanding position in the palace complex of Patan. It is supposed to be the first specimen of Shikhara style architecture in Nepal. It is the only temple in Nepal having 21 spires and is completely 21 spires and is completely mad of stone. The beauty, they say, lies in the eyes of a beholder. That might be true to something beautiful, but what you want to tell about something sublime. If there is something that challenges Biblical Garden of Eden in its splendor and magnificence, it’s Pokhara – the ultimate destination for the wanderlusts and those who appreciate, of course, beauty in its pristine glory. The enchanting valley of Pokhara valley is situated at an altitude of 827 meters from sea level. An incarnation of the religious heaven, this celestial city is also known as the “city of seven lakes”. Just 200 kilometers west of Kathmandu, it is linked by Air and by road from Kathmandu and the Indian border Sunauli. Pokhara offers magnificent views of Dhaulagiri, Fishtail, Manaslu, five peaks of Annapurna and others. This is one of the few places in the world to provide such a dramatic view in a sub-tropical setting. 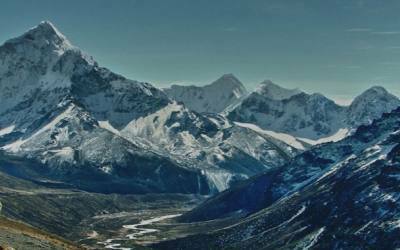 The nearest snow-capped mountain, Fishtail, is less then 30 kilometers from Pokhara. Pokhara’s numerous lakes offer fishing, boating and swimming. Early in the morning drive about haif an hour to Gothadi village. From here trek for 45 minate to one hour to reach a tower of Sarangkot ( 1600m). 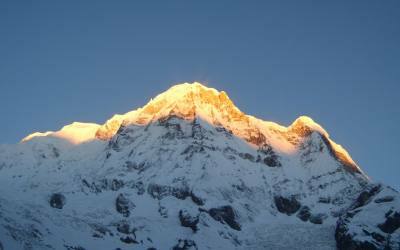 From where you can see very beautiful sunrise and views of Annapurna range. After breakfast trek for 10 k.m. to Naudanda. Which will take approximate 3 hour. Along the way, we will pass many different villages and school. There is a good views of Fewa lake , annapurna range and passing through rice paddy and beautiful terrace along the way. After finishing trek take a bus ride for haif an hour to pokhara. During the day there is possible to visit different sight seeing spot in pokhara. The view of the Annapurna Himalaya from Sarangkot is almost a religious experience. From here, you can see a panoramic sweep of Himalayan peaks, from Dhaulagiri (8167m) in the west to the perfect pyramid that is Machhapuchhare (6997m) and the rounded peak of Annapurna II (7937m) in the east. Most people come here at dawn or dusk, when the sun picks out the peaks in brilliant colours. Fewa Lake, the second largest lake in the Kingdom, is the center of attraction in Pokhara. It is the largest and most enchanting of the three lakes that add to the resplendence of Pokhara. Another of nature’s wonders in Pokhara is the Mahendra Gupha. This large limestone cave is locally known as the House of Bats, an apt name for it. A two-hour walk to the north of Pokhara, it is best to bring your own torch to see the stalactites and stalagmites, as well as the local winged residents. Another of Pokhara’s natural wonders that unfailingly interests visitors is the Seti river. Flowing right through the city, this river runs completely underground at places. Amazingly, at certain points the river appears hardly two meters wide. But its depth is over 20 meters! Mahendra Pul, a small bridge near the old Mission Hospital, provides a perfect view of the rivers’s dreadful rush and the deep gorge made by its powerful flow. The Barahi temple is the most important monument in Pokhara. Built almost in the center of PhewaLake, this two-storied pagoda is dedicated to the boar manifestation of Ajima, the protectress deity representing the female force Shakti. Devotees can be seen, especially on Saturdays, carrying male animals and fowl across the lake to be sacrificed to the deity. The Pokhara Museum, located between the bus stop and Mahendra Pul, reflects the ethnic mosaic of western Nepal. The lifestyles and history of ethnic groups such as the Gurung, Thakali and the Tharu are attractively displayed through models, photographs and artifacts. One major attraction is a display highlighting the newly-discovered remains of an 8000-year-old settlement in Mustang. Locally known as the Patale Chhango (Hell’s Fall). Devi’s Fall (also known as Devin’s and David’s) is a lovely waterfall lying about two km south-west of the Pokhara airport on the Siddhartha Highway. Legend has it that a trekker (Devin, David..) was washed away by the Pardi Khola and disappeared down into an underground passage beneath the fall. Day05, 06, 07: By private transport or by tourist bus to Chitwan national park. the drive will take about 5 hours. Jungle Safari in NepalNepal is a land of extreme contrasts in climate and geography. It has a unique topography ranging from lowlands with sub-tropical jungles to arctic conditions in the Himalayan highlands. Within a mere 150 kilometers, the land rises from near sea level in the south to over 8,000 meters in the north. This together with the monsoon rainfall along the south facing slopes has resulted in compacting virtually all climate zones found on planet earth. as result , Nepal has been endowed with the great diversity of life- zones providing a home for a large variety , birds and animals. Terai lowland is the richest habitat with the tall grasslands interspersed with reverie and hardwood sal forest. Here one can see wild life such as the swamp deer, musk deer, black buck, blue bull, and the Royal Bengal tiger, Gharial and mugger crocodiles, and the last breed of Asiatic wild buffalo. This area is also rich in birdlife with verity of babblers and orioles, Koles and drongos , peacocks and floricans, and a multitude of wintering wildfowl. On your arrival at Chitrasari you will be received by our staff. You will then be transferred to our Resort where you will be offered refreshments & be given a briefing on our Resort & its facilities. After being given your programe for the day, your room will then be allocated to you. 15:00 - Elephant briefing & bathing. 16:00 - Elephant safari. An excellent opportunity to see four different kinds of deer, rhinoceros, wild boar, monkeys, leopard, sloth bear and the Royal Bengal Tiger (if you are lucky). You will also encounter many other smaller mammals that have made Chitwan their home. 19:00 - Thaw cultural dance presentation (which you can also participate in) by the local villagers or a slide show presentation on almost everything under the Chitwan sun. Second day: Activities at inside the park (Elephant back ride, jungle walk, canoe trip, tharu stick dance and Elephant wash). 05:30 - Wake up call. 06:00 - Tea/coffee followed by nature walk. An excellent opportunity to see a great many of those 524 different species of birds found in Chitwan. 09:00 - Canoe ride along the Rapti river. An excellent opportunity for bird watching and for seeing the 2 rare species of crocodiles; the Marsh Mugger and the fish eating Gharial. 10:00 - Visit to the Government Elephant Breeding Center. Walk/drive back through the Tharu villages to our Resort where you can take a leisurely swim or relax by the poolside. You can also spend the time before lunch to gaze at the fishes found in Chitwan in your own fish pond or play a game of tennis or pool table with your friends or just spend a few quiet moments in our library with a book. You can even let your children play by themselves in our children’s playground. Your choices are limitless. 15:00 - Visit to the National Park Visitor’s center where you can learn more about the history of the National Park and about wildlife. 16:00 - Village tour to a nearby ethnic Thaw village where you will learn more about the life and lifestyles of the Thaws. 19:00 - Tharu cultural dance presentation or a slide show presentation. 05:30 - Wake up call. Tea/coffee followed by elephant safari, nature walk or you can just spend the morning as you prefer. 09:00 - Drive to Bees Hazzar Taal (Twenty thousand lakes) where you will see crocodiles and lots of birds in and around these lakes. 11:00 - Back to our Resort where you can spend time at leisure. 15:00 - Jungle Drive through the grasslands, riverine forests and sal forests to Kasara (the National Park’s head quarters) Gharial hatchery farm where you will learn about how crocodiles are brought up at this farm & then later released into the rivers. 19:00 - Thorn cultural dance presentation or a slide show presentation. Day08: By private transport to Bhaktapur city. The journey will take 6-7 hours of Driving. Bhaktapur is lying at 12 KM east of capital city Kathmandu. 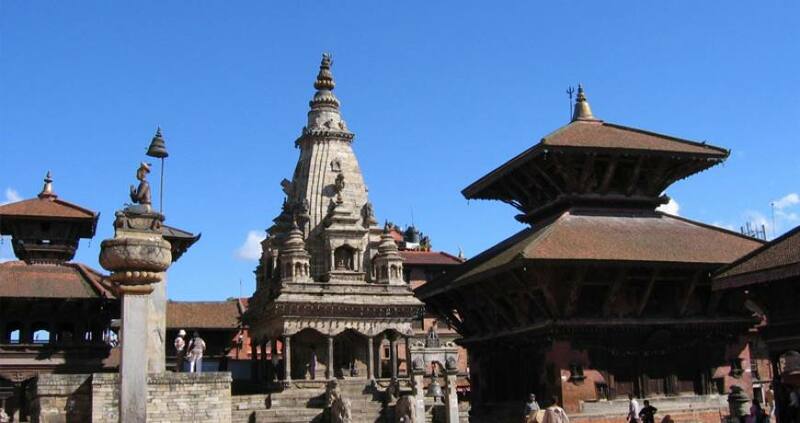 Bhaktapur is "the city of Devotees". It is locally known as "Khwopa and Bhadgaon" which is world renowned for its elegant art, fabulous culture , colourful festivals, traditional dances and indigenouslifestyle of different people of different religion. For its majestic monuments, temples and the native typical newar lifestyle best known for their long history of craftsmanship, the ancient city is also variously known as the " City of Culture ", "Living Heritage " , "Nepal’s Cultural Gem " and "An open museum". Given such unequaled opulence in ancient art and culture, Bhaktapur is more like an open museum, and the ambiance here is such that it instantly transports visitors back by centuries. This conch shaped hostoric city is spreading over an area of 6.88 square KM at 1,401 meters above sea level, which was founded in the 12th century by King Anand Dev Malla.Bhaktapur was the capital city of the Greater Malla Kingdom till the 15th century AD. The many of Bhaktapur’s greatest monuments were built by thethen Malla rulers. The ancient ritual dances and festivals are still observed by the locals with the same fervour and ehthusiasm as their ancestors did centuries ago. King Yaksha Malla (15th ventury) heavily fortified this city. Bhaktapur has its gem in Durbar Square and Changu Narayan temple-- a World Heritage site listed by the UNESCO. Strewn with unique palaces, temples and monasteries best admired for their exquisite artworks in wood, metal and stone, the palatial enclave has bewitched pilgrims and travelers for centuries.Yet, they are not all though. Stretching all along the township, the panoramic Himalaya levitates in the skyline as if to keep vigilance on the city’senviable beauty and splendor.It grows from a collection of villages strung along the old trade route between India and Tibet. Changu Narayan is one of the most important monuments of the Kathmandu Valley and is full of art works on metal and wood. Situated 18 km east of Kathmandu city and standing 1541 meters above the sea level, this monument is significant from religious, cultural, historical and archaeological viewpoints. The temple itself is dedicated to Vishnu (often called Narayan). The site is termed with different names during ancient period such as Champak Narayan , Dolashikher and Dolaparvat and become famous with the names of Changu Narayan in the medieval period to at present .The lord residing in this place is worshipped by the Hindus as Garuda Narayan Lokeshwor one among this many Lokeshwor is Mahayana Buddhism. This is one of the seven world heritage sites of the Kathmandu Valley listed on the UNESCO world heritage list. The history of this site dates back to 4th century AD. According to the Gopal Raj Vanshavali a fathomable chronicle believed to be written in the 14th century AD credits king Haridutta Verma as the founder/builder of this shrine, who also built 3 other shrines dedicated to Lord Vishnu in three cardinal points of the valley: Bishankhu Narayan in the east, Shikhaar Narayan in the south and Ichangu Narayan in the west. According to a legend, Lord Vishnu while fighting with the demon king named Changu killed a Brahmin named Sumati. Guru Sukracharya, the teacher of the dead Brahman was angry at Vishnu and cursed him that he will be beheaded by a Brahmin in the future. After this incident, Lord Vishnu lived in champak (Michelia Champaca) forest. A Brahmin named Sudarsan lived in a village, not very far from the forest. The Brahman had a cow and his cowherd brought him the milk in a bucket, the story further says that the Brahmin could notice the lesser amount of milk being brought to his champak village. To solve the mystery, the angry Brahmin cut the Champak tree beheaded lord Vishnu, came out of the tree. Nagarkot is an international tourist destination with spectacular views of the whole Langtang range, sunrise on the mountains and sunset views. We can see the panoramic views of the captivating landscapes and hills with the Kathmandu valley. You can breathe the cool mountain breeze in the resort town of Nagarkot. There are resorts from top-end quality to decent lodges to accommodate you and serves different cuisines. Every additional night hotel in kathmandu or in Pokhara will cost US$ 40 for double room with bed and breakfast and US$ 35.00 for single room. P. O. Box: 13818, Thamel, Kathmandu, Nepal. Tamaudhi Square, Bhaktapur - 11, Nepal. 2 full day sight seeing tour around kathmandu valley with English speaking guide and by private transport. All the ground transportation by private transport. Items of personal expenses such as alcoholic drinks, cold drinks, laundry, tips for trekking staffs and hotels etc. Nepal entry visa fee US$ 40 (duration 30 days from date of issue)- Available at Royal Nepalese Embassies and Royal Nepalese Consulates abroad or on arrival at Tribhuvan International Airport in Kathmandu.